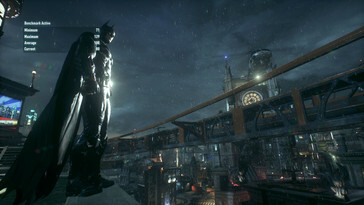 Whereas the console version of the game has been pretty well-received by both media and users, the PC installment of the game has garnered its fair share of criticism - justifiably so: even our most potent system with Core i7-3770K and GeForce GTX 980 was plagued by substantial frame-rate drops in single-player mode. 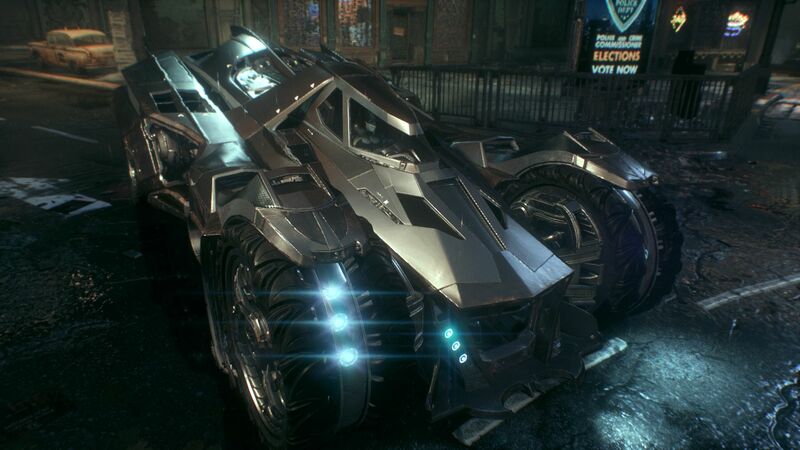 Especially when calling the Batmobil or while driving it, Arkham Knight stuttered heavily and froze completely at times. 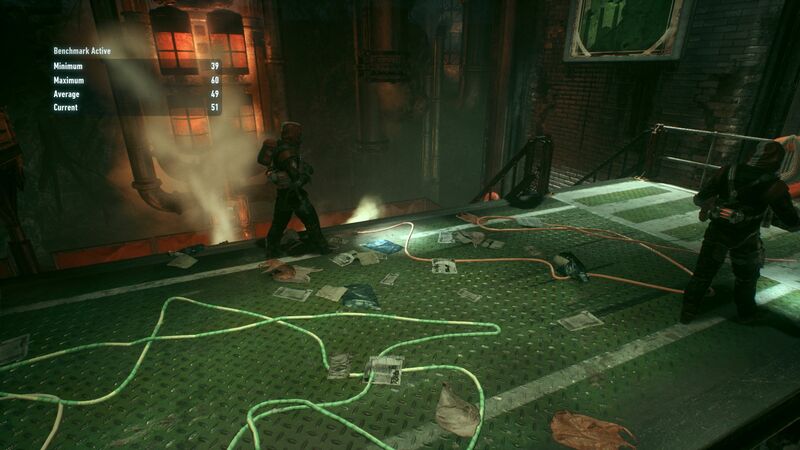 This behavior doesn't just negatively impact the flow of the game, but sometimes results in an unwelcome "game over". 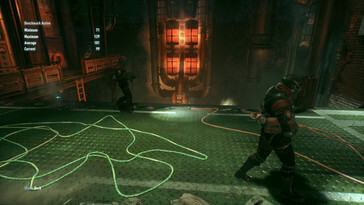 Depending on the system the game is installed on, there are additional smaller to medium-large bugs the user might encounter. 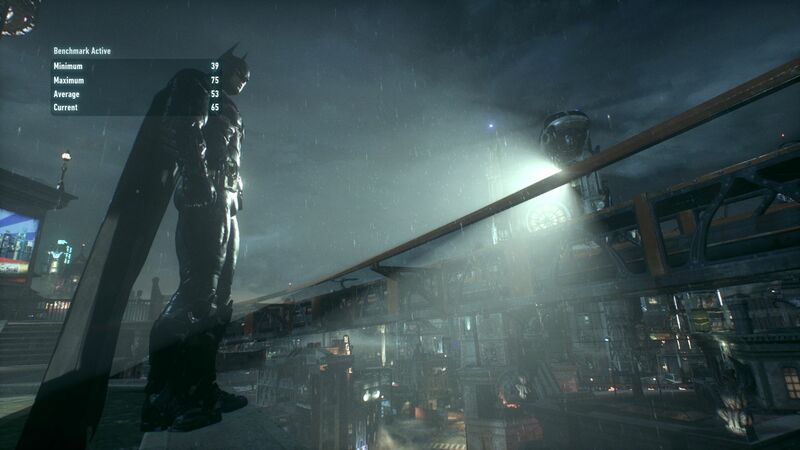 An example: Arkham Knight refused to work in full-screen mode on the Schenker XMG A505. Another system - an AMD Kaveri desktop - produced errors while set to the typical minimum resolution of 1024 x 768 pixels. 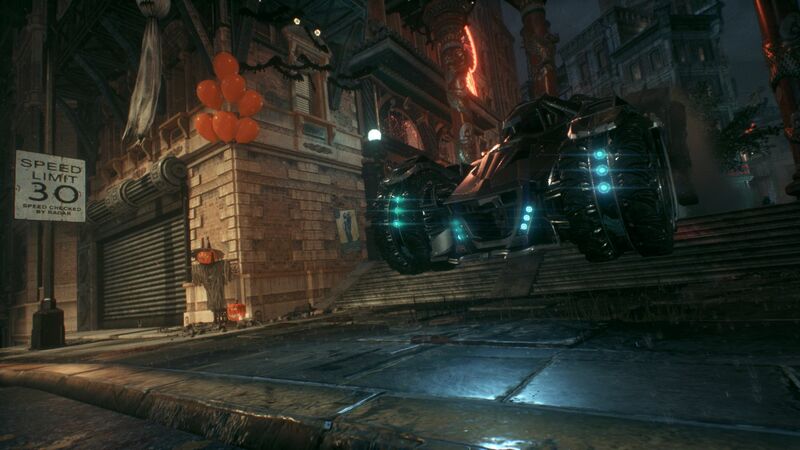 Of course, bug like this are quite common, but Arkham Knight also has very high demands on the hardware. At a minimum, 6 GB of RAM and a GPU with at least 2 GB VRAM are required; 36 GB of hard drive space are also nothing to sneeze at. At least we didn't have to deal with crashes during the review period, but that can be - at least to some extent - attributed to the newest set of drivers we used for our tests (Nvidia 353.30 & AMD 15.6 Beta). Another aspect we need to mention are that some effects are exclusive to Nvidia. 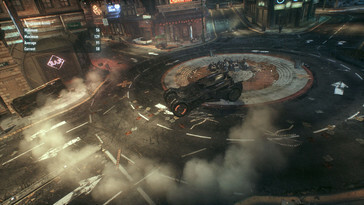 While options like "Enhanced Rain" and "Enhanced Light Shafts" are available with AMD and Intel GPUs, "Interactive Smoke" and "Interactive Debris" only work on computers and notebooks equipped with Nvidia chips. Although the latter effects look rather cool, they do take their toll on the performance. 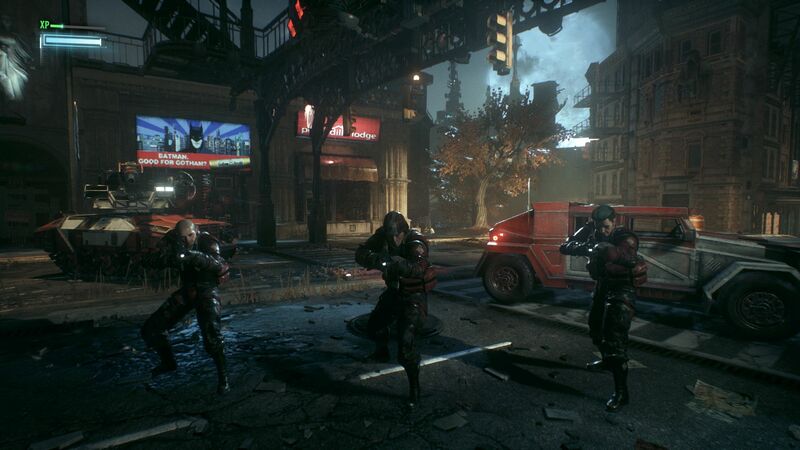 Even with the aforementioned GeForce GTX 980, the frame rate decreases by 30 % (Full-HD, maximum details). The most demanding effects are "Smoke/Fog" and "Paper Debris". 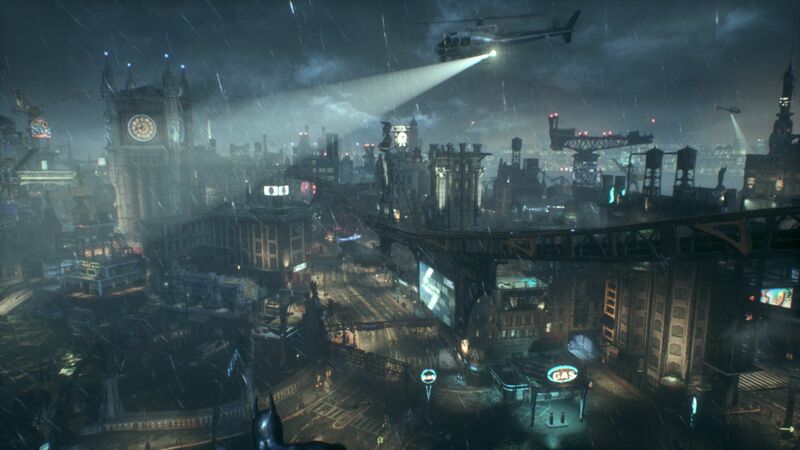 The rain and light effects, on the other hand, don't really impact performance. 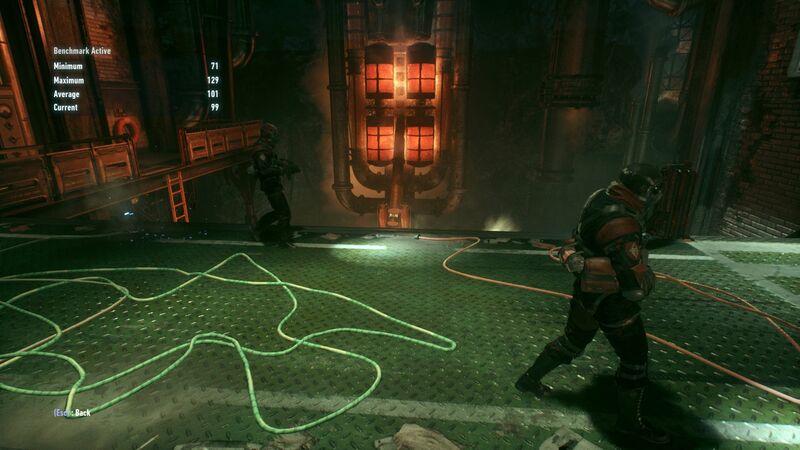 Anti-aliasing effects are - with SMAA as the sole choice - pretty moderate; it also doesn't matter much if the user picks low or medium textures. Although a minimum of 3 GB of RAM are recommended for the "normal" setting, we didn't see much of a difference - at least not during our benchmark run with the GeForce GTX 960M. We should point out here that there's no "high" setting for textures. The graphics menu has 11 options altogether, among them settings for resolution, vertical resolution, graphics mode, shadow quality, and detail level. 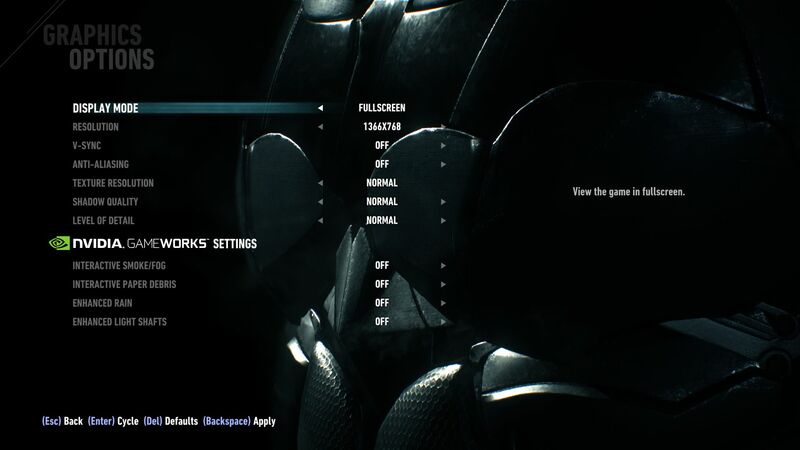 The other available settings we've talked about already. Aside from the smoke and debris effects, changes don't require restarts. 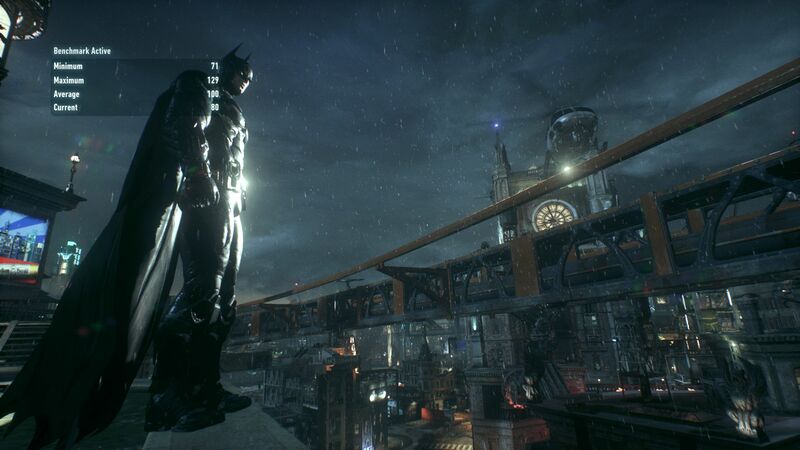 Visually, Arkham Knight looks very good. Despite the fact that the gloss- and plastic-effects seem a little over-the-top, we tend to like the beefed-up Unreal Engine 3 a lot. Both the texture quality as well as the particle quality are above average (explosions, sparks etc.). Systems with Nvidia GPUs look exceptionally good when rendering smoke. From a gaming perspective, Arkham Knight definitely has its strengths, although the game ends up being repetitive in the long run (take the missions for example). The intro-sequence is quite compelling, choreographed well and makes the user yearn for more. A less compelling feature is the "normal" behavior of the Unreal Engine 3: depending on system and graphics settings, the textures are loaded too late, which in turn leads to a rather mushy graphical representation initially. We also simply don't understand the built-in 30 fps limit. At least this limitation can be removed manually. 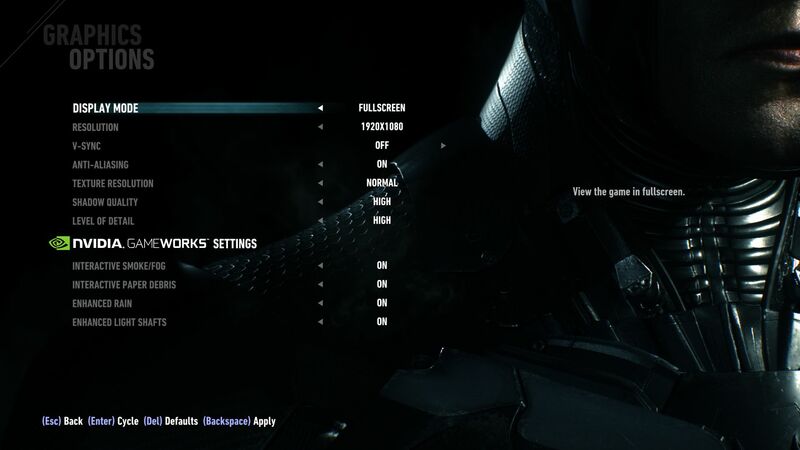 In order to do so, one needs to open the gaming folder (hard drive: Steamsteamapps\common\Batman Arkham Knight\BMGame\Config) and change the "MaxFPS" setting in the .ini file named "BMSystemSettings" from 30.000000 to 9999.000000. Very good: excluding the intro-videos - which can't be skipped - leads to short load times. 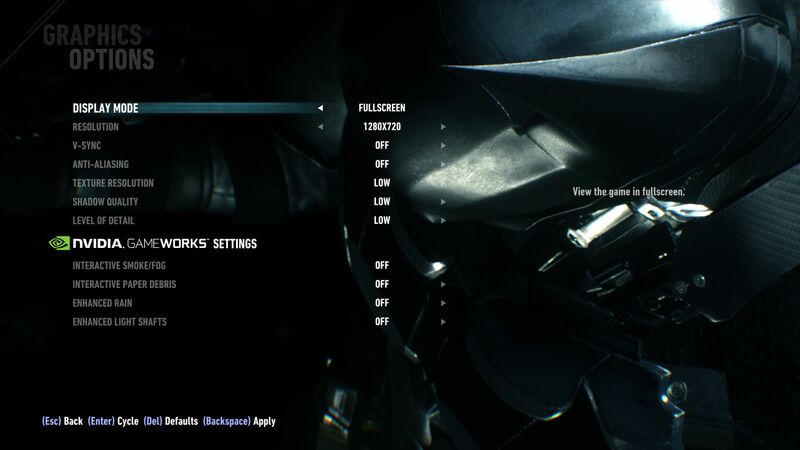 Arkham Knight comes with an integrated benchmark called "PC Performance Test", which is accessible using the options menu. 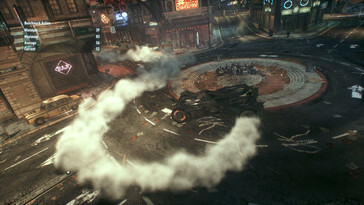 The sequence is about 1.5 minutes long and utilizes various scenes at different angles. 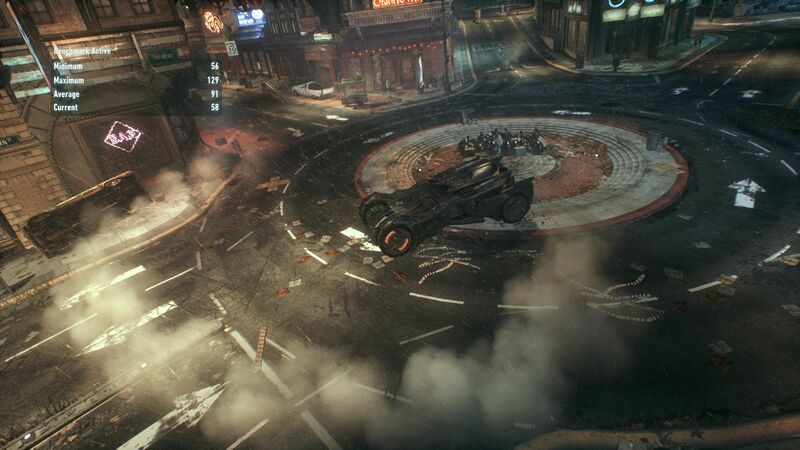 It also displays the various GameWork-effects (see video). 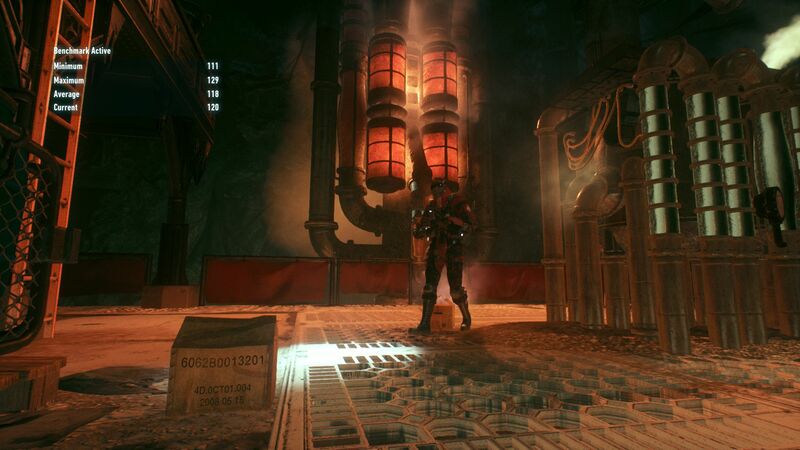 At the end of the test, the benchmark not only displays the average, but also the minimum and maximum frame rates. 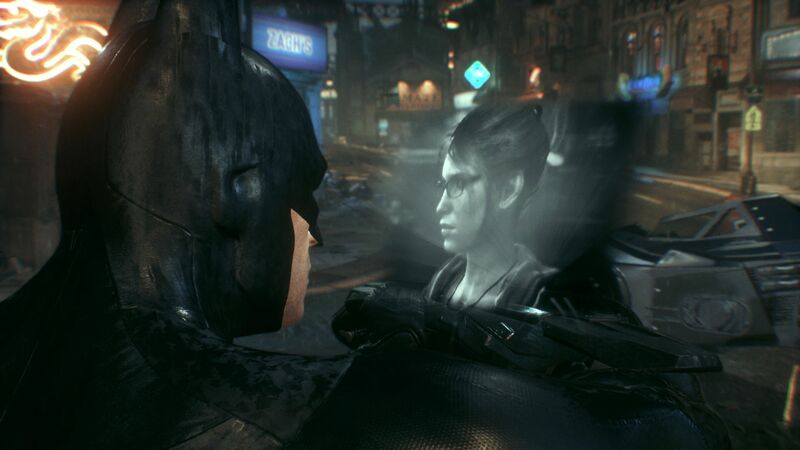 The minimum frame rates can't be compared to a "real" game, so it pays of to allow for some reserves. Our evaluation of the performance is based on the benchmark sequence. 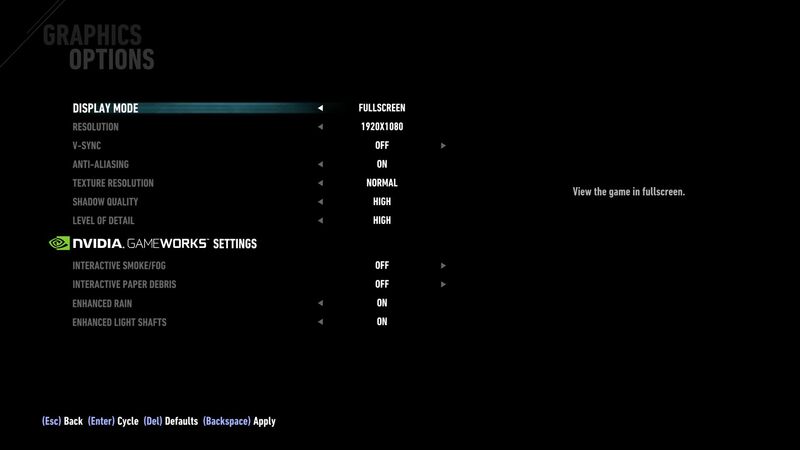 As the screenshots below indicate, there are no significant differences between the settings save for the GameWork-options. 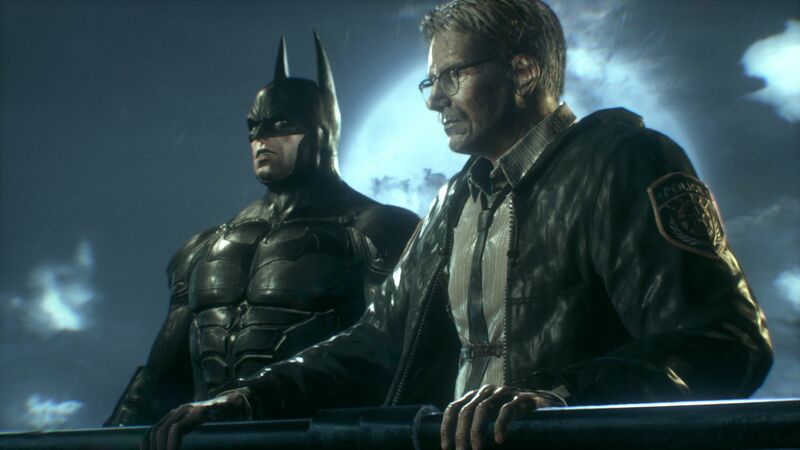 An unfortunate side effect: Arkham Knights has high demands on the hardware even at low settings. Low-end GPUs like on level with the HD Graphics 4600 or the GeForce GT 740M are generally simply not powerful enough. For 1280 x 720 pixels and low details, at least a GeForce GTX 850M is necessary. 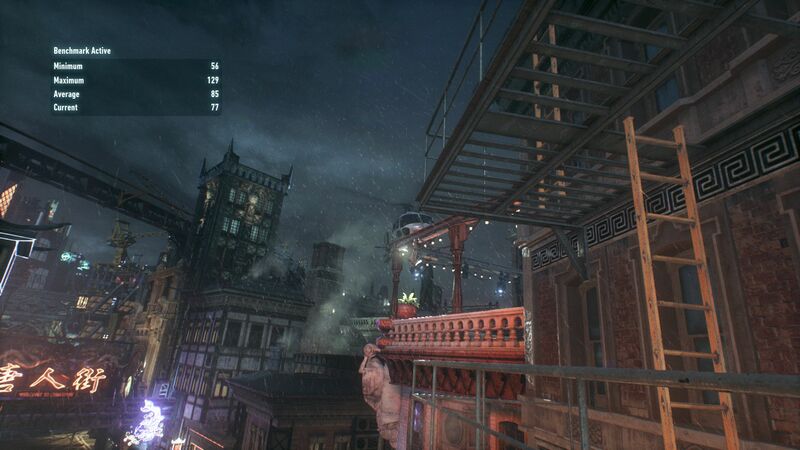 Normal settings and a resolution of 1366 x 768 pixels requires at least a GeForce GTX 850M or better. 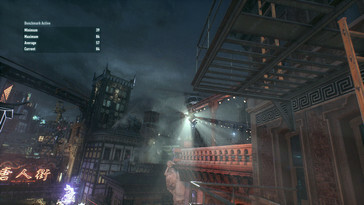 1920 x 1080 pixels and high details (Enhanced Rain & Light Shafts On) require a GeForce GTX 870M or above for smooth gameplay. A combination of Full-HD and active GameWorks effects is only possible with either a GeForce GTX 970M or a GeForce GTX 980M (not accounting for dual-GPU setups). All tested graphics solutions could not handle 4k (3840 x 2160 pixels) output. High settings caused stutters even with a GTX 980M - and that's with Smoke and Paper Debris deactivated. 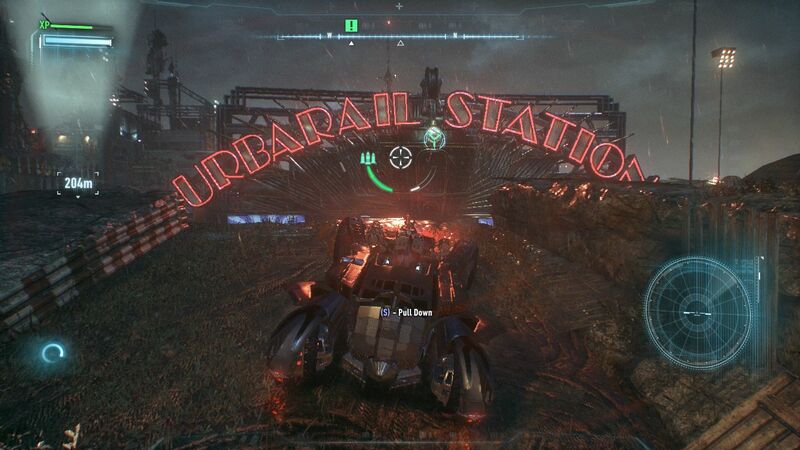 The CPU didn't matter that much and even a standard Intel processor with Turbo Boost is fast enough. 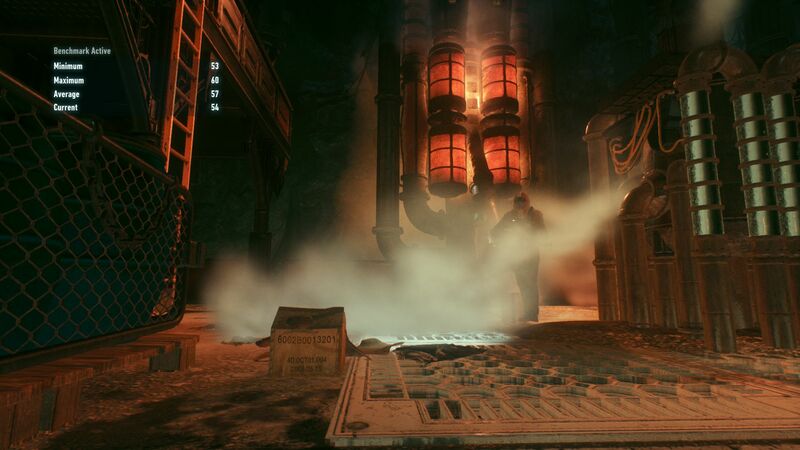 All things considered, we would recommend postponing a purchase until the developers have optimized the PC version and brought the frame-rate drops at least somewhat under control. 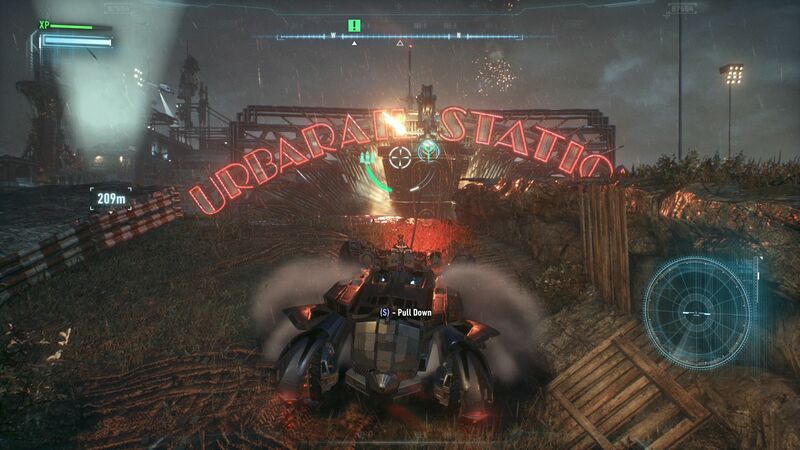 Note: as soon as Arkham Knight is installed on about 5 systems, the activation is blocked for at least 24 hours - a behavior we normally know from EA and their Origin platform. At this time, we would also like to thank Nvidia and Schenker Tech for the provided keys. 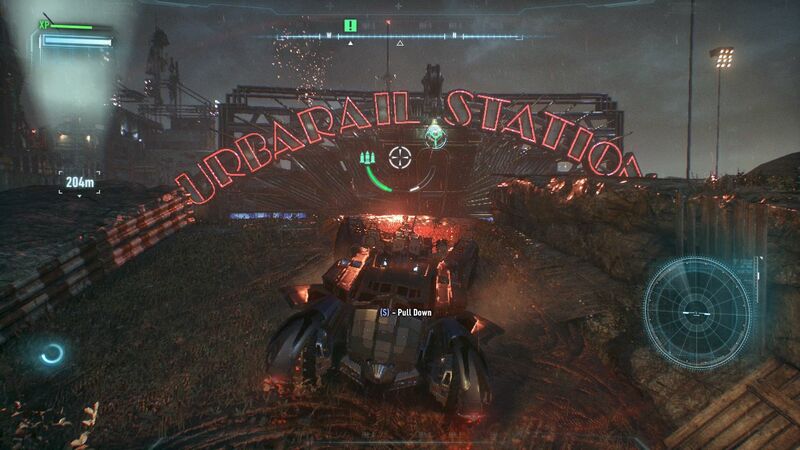 Update: because of the substantial technical problems, at the time of writing, Steam has stopped the sale of the game. The OS on these notebooks is 64-bit Windows 7 (Win 8.1 @XMG A505). The desktop systems feature CPUs/APUs from Intel and AMD, SSDs from Micron, Intel and Samsung, motherboards from Intel and Asus, as well as GPUs from Nvidia and AMD, Our 4 K monitor is Asus' PB287Q.